Using both palette knife and brush technique, Richard creates vibrant oil paintings which capture the beauty and majesty of Muskoka on canvas. Although he also works with pastels and water colour, he prefers oils because of the richness and depth of colour which this medium provides. With some artistic licence, Richard paints what he sees in nature. In his view, it is difficult to improve on Mother Nature’s creations. 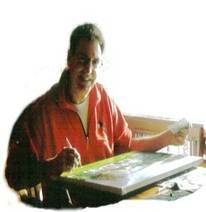 Richard specializes in commissioned paintings of his client’s homes, cottages and/or favourite scenes. He has well over 250 commissioned paintings to his credit and his work can be found in homes not only in Canada but also in the United States, Great Britain, Europe and South America. By visiting the client’s property and using a series of photos, Richard captures the very essence of what makes the home or cottage a very special place. A commissioned painting, which makes a wonderfully unique gift for a very special occasion, will allow you to “Preserve your Muskoka memories”. In addition to the framed paintings that are exhibited in his own and other galleries, his work can be seen in print as he has created the cover paintings for Muskoka author Robert Rea’s novels entitled: A View to the North and Sundreams.